This Elstead Artisan 2 arm twin wall light in aged brass finish forged ironwork is traditional and features a stepped circular wall mount, scrolled curved arms fitted with candle pans and candle tubes and lower barley twist finial. The handsome Artisan wall light features attractive scrolls, twist detail and will accept optional glass shades if desired. 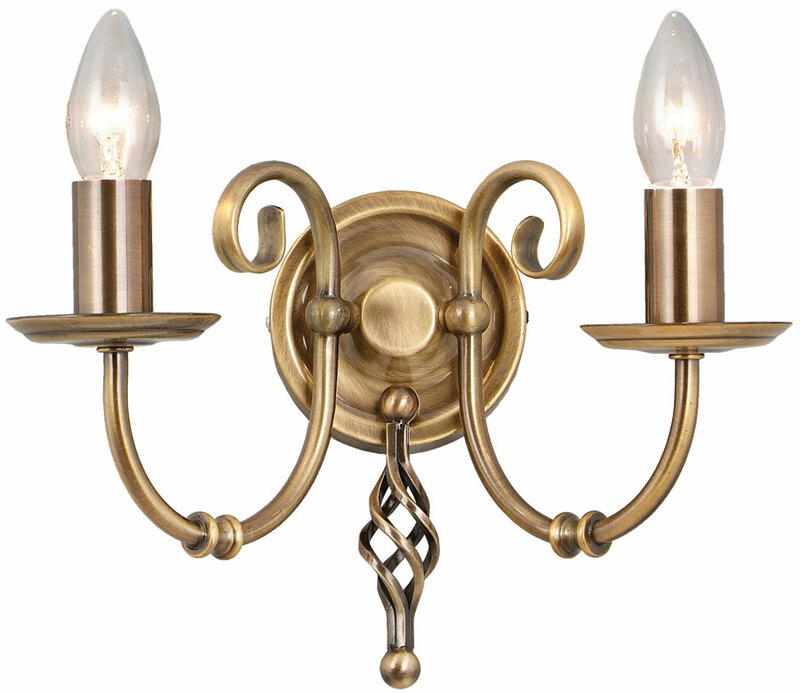 This is a high quality hand forged metal wall fitting that adds opulence to modern and traditional homes alike. Ideal for any living room, dining room or hallway wall. There are matching fittings available in the Artisan aged brass finish lighting range; please see below. Also available finished in matt black, please enter the term Artisan in the search box at the top of this page to find the complete collection. This timeless design is supplied by Elstead Lighting, a British company that specialise in the manufacture and distribution of quality decorative lighting such as the Artisan 2 arm twin wall light in aged brass finish forged ironwork you see here. Does this wall light have a switch? Hello Anna and thank you for the question. The Artisan double wall light is not fitted with a switch.